Robert Oster can make you like almost any color. I'm not usually crazy about orange inks, but Robert Oster is changing that for me. Yellow-orange inks are nicer to me than the bright pumpkin oranges, and Robert Oster Peach is a nice yellow-orange. The shading is beautiful. I got my sample of Peach from Vanness Pens. Peach is a pretty yellow-orange with medium shading. Peach does have some lovely shading in ink drops. Ink swabs for comparison, left to right (top to bottom for RSS): Robert Oster Red Orange, Robert Oster Peach, and Robert Oster Tangerine. To see the Robert Oster inks together, click here. Diamine Amber, Papier Plume Sazerac, and Sailor Jentle Apricot. I think Peach falls in between Diamine Amber and PP Sazerac. All six of these inks have medium shading, so no matter which one you pick, you will get some nice shading. To see the orange inks together, click here. I started off with a Pilot 912 FA and then switched to a Yellow Vanishing Point, broad nib. 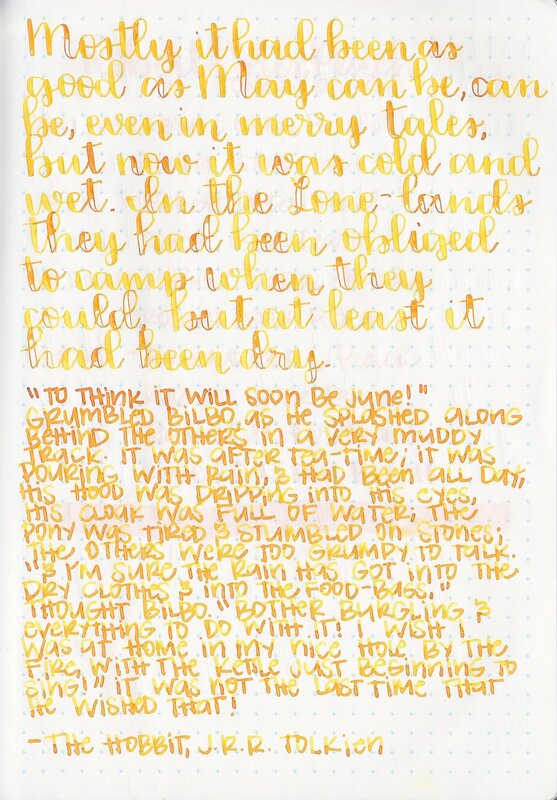 In the flex nib, the ink looks a lot more yellow-orange, and in the broad nib it looks more orange. Overall, I really love this ink. The color is bright and happy, and the shading is beautiful. I only have a sample of this ink, and I will absolutely be buying a bottle in the near future.